Thanks everyone for helping folks to enable the UI. I appreciate the assistance. I've updated the first post to this thread, so hopefully people won't have to keep asking. Dont suppose anyone can help me? I cant seem to get this to work. Any ideas where i need to look? best regards & thanks for your work in the past and now ! I am having an issue, seems to be specific to movies so far, where filebot is processing but only spitting out part of it. Not sure how this is happening. My work flow is like this. deluge downloads to "incomplete" folder -> on completion moves the file to "completed folder" -> filebot docker is processing out of that folder and putting it in the plex library folder. The incomplete and completed folder are on the same disk and moves are instantanious, at least when i do it manually between them via file explorer. Any plans to update this container, fix scraping etc? Can someone recommend something else? My filebot is mostly working fine, but unfortunately it has stopped detecting folder changes automatically. Any idea why that might be? If I restart the container to run it, it works fine. Not without further information from you. Tools - Diagnostics, post complete zip. When starting/restarting the container, it scans the input directory properly, then hardlinks the files over. When just letting it sit and monitor though, no changes are detected. This used to work and no config changes have been made since it stopped working. Ya it just sits there. Nothing I can do seems to make it actually detect folder changes to run again. What do i need to change to have filebot move instead of copy? Anyone have any suggestions why filebot is not generating hardlink files? I've gone into the filebot.sh file and edited it so that it's "--action hardlink"
Weirdly enough the folders are generated (movies, tv-shows, and even the show/seasons) but the actual "hardlink" itself is not being generated? I'm mostly just trying to keep things "linked" so that I can still seed while being able to add clean files to Plex, etc. Did you different directories for input and output? I'm getting the following output in my log on every try triggering the script. Do someone has a clue what's that about? Last time I got that error Simply reinstalling the Container completely solved the issue for me. No changes on my config. This time it didn't helped. First thanks for you're docker. My filebot has also long ago stopped scanning for folder changes. Is there any way to fix this? 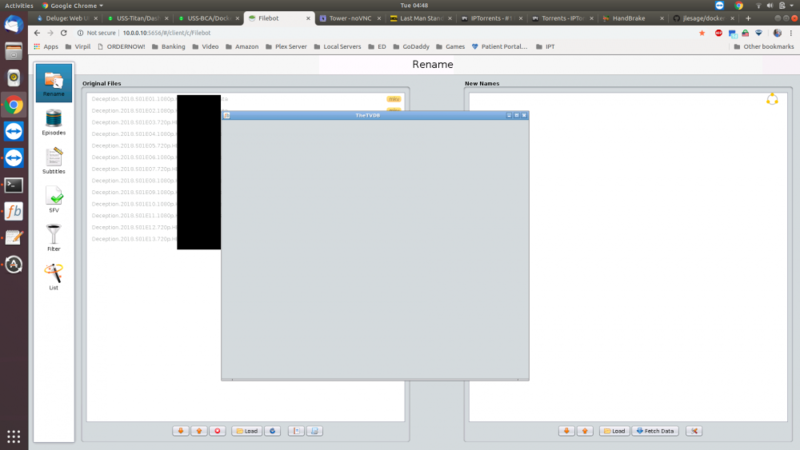 Hello i am having a problem using filebot i load a folder with a show and i try to rename it and i click on match i select thetvdb and then a box pops up asking to clarify the show i am looking for (Image 1.png) and then a second box pops up (image 2.png) but it is blank and i can not close the box the only way to get rid of it is to go in unraid docker and restart the container. is there a way to fix this?